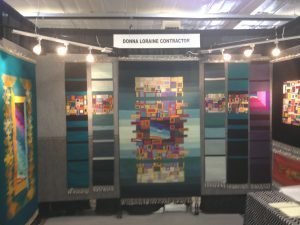 Donna Loraine Contractor is an award winning tapestry artist. Her work is exemplified by strong colors, gradations, geometrics and hand dyed yarns. She sells her work in galleries, art and craft shows. In this interview Donna speaks about some of the nuts and bolts of choosing and doing shows, where you are the gallerist meeting and talking to the public. What led you to do your first craft show? 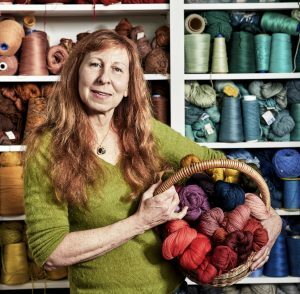 I knew I needed many sources of income to make it as an artist, and I wanted it clear from the beginning that I was not just a weaver, but a Fine Art, Tapestry Weaver. 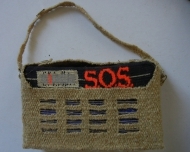 I began doing craft and art shows because I really had to understand who my market was. 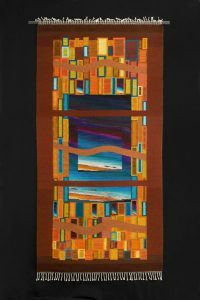 I wanted to make large, striking geometric style tapestries that would sell at high price points. This meant I was in competition with “Fine Art” painters etc., whose large works also had high price points. Knowing who you are trying to sell to and who your competition is, is the first step in choosing which shows to do, as well as what your signature style and design will be. 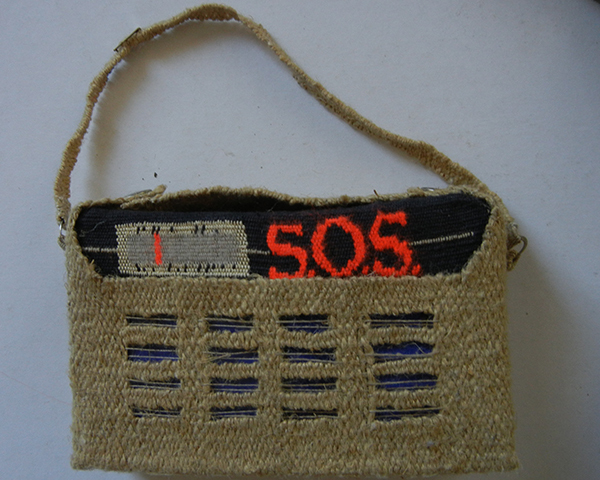 How long have you been doing craft shows? 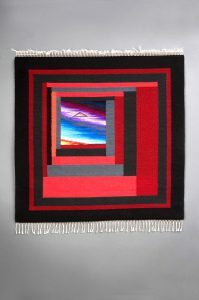 I started weaving in 1980 when I apprenticed at the Santa Fe Weaving Center. I mostly did production cloth weaving. Then I started to weave rugs and taught myself tapestry. (I was also a production potter at the same time.) 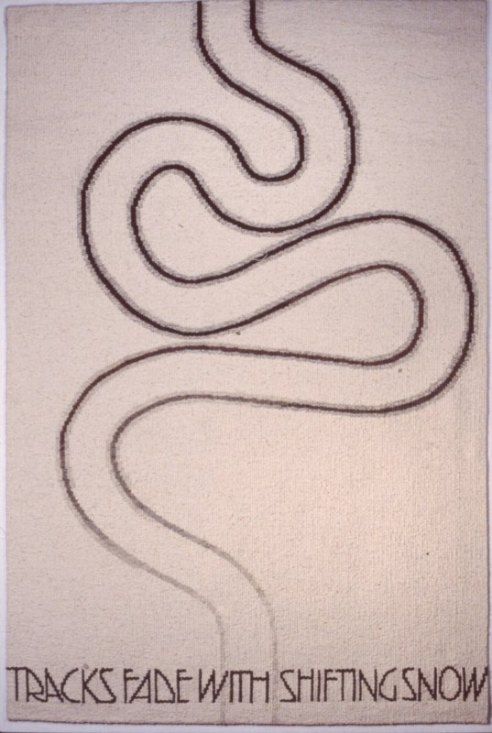 I started to put my tapestries in galleries in 1988 and won my first public art competition in 1991. That same year I did my first outdoor Art show. I only do indoor shows now. I had 2 kids in the midst of all this, one in 1981 and one in 1991 and I also lived in India for 4 years on and off (1982-1988) where I did production pottery and helped in a craft cooperative. My first gallery was in Santa Fe. I just kept going into the gallery. I made friends with the workers and owner and then asked about showing my work. The second gallery had a policy of new artists bringing their work on the first Friday of each month to be reviewed for inclusion in the gallery. You dropped your work off at noon and returned at 4:00 to see whether your work was accpeted. How do you choose a show to exhibit in? Back when I started doing Art and Craft Fairs and Shows in 1991, there were a lot of other tapestry artists. Now I am usually the only one. When I think of doing a new show, I go to it several times. The first time I see if my work is a good fit. I look to see if any other higher end art is being exhibited. And, if so, whether it is selling? I converse with the artists, look to see how the show is set up, and how many sales are taking place. If I find a match, I enter. My work is higher priced, so I do best in top notch shows where clients have money. I don’t do well at shows with lots of artists selling souvenirs cheaply. When I did my first show we sent slides. Now the application process is much easier. 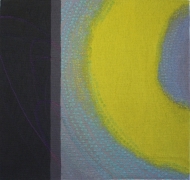 Many shows use Call For Entry or Juried Fine Art Services, both online. You create a portfolio and a statement and usually you can enter shows by a few clicks and pay with PayPal. What are the costs involved in doing a craft show? Costs for a high end show will be more for both the entry fee and the booth fees. If shows are local, it’s easier to keep the other costs down. I did my first out of state show, BAM (Bellevue Arts Museum) in Washington State in 2015. I had hotel costs and meals. Luckily, I had a big sale so I ended up with a profit, but it was a gamble, as all shows are. What is your price range? Is there a price point that sells best for you? How do you arrange your booth? There are lots of artists who try to make a gallery look in their very small, usually 10’x10’ booth. I believe the first hurdle is to get people in the booth. The work might not appeal to as many as you would like, so I pack it in, but curated, like I would design a piece of art. How are your sales? Are they consistent? I have had only one show, which is closed now, that was consistent, not only in sales but for commission work, for most of the year. This is another aspect of doing shows, perseverance is a must. You have to build a presence over several years. A lot of it is making connections, filling your mailing list, both email and snail mail. You have to follow up with any people who were more than idly interested. You may never know that because you did that show a sale was made at the gallery, or when that interested person finds your card again and calls you up and buys a piece from your studio or places that commission order. Do you find particular styles or types of compositions sell better for you than others? I have a signature style that I showcase in different series. Some people like my Feng Shui pieces while computer geeks love my math tapestries. In this way I extend the audience group for my work. Since my work is a bit pricey, I find that clients with the money to afford them tend toward abstract more than realistic, representational art. 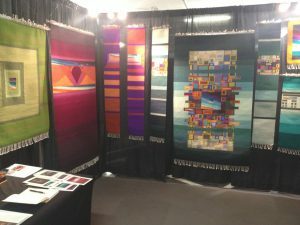 Do you find that you have to educate the public about what tapestry is before you can make a sale, or do they buy your work just because they like the piece? Perhaps both? I have had clients who really needed to know all about the concepts in the design. The more I told them, the more interested in purchasing the piece they became. But I’ve also had clients who just did not want to talk at all. They knew what they liked. “Here is your payment, thanks and goodbye.” And others that were intent on collecting me as well! How do you bring customers into your booth? I actually use the line: “Because they are wool they are touchable.” Only select people get this line, but no kids or eaters. I also ask where they are from, etc. If they are still hesitant to come in I invite them to turn the pieces over and see how they are all finished on both sides. That usually gets them right in. 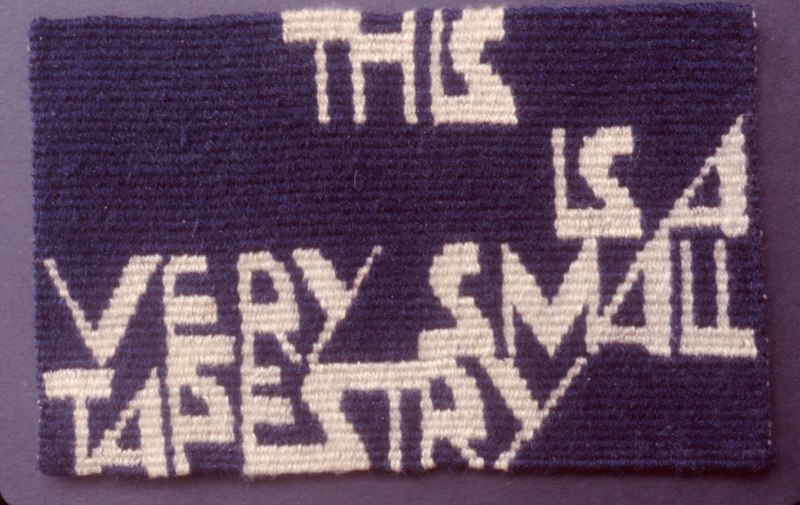 Do you demonstrate tapestry at shows? I never do demos as they just distract people from the work I’m trying to sell. I do have a rather large group of collectors of my work who own multiple pieces, (my best collector owns 17, next up has 8). These people get a special invitation on the postcard or email blast I send out. I offer them a collector’s discount and sometimes I offer a discount off any tapestry over $1000. I also personalize the show’s postcard with a picture of my work and a note. Art shows are really my main source for contact information from interested potential clients. Do you try to engage people who come into your booth? If so, how do you do this? I really think that telling your story as an artist is very important when you are trying to make a living from selling tapestries. Art shows put you in front of the public and allow you to do that. If you are an extreme introvert you can learn to do this. There are many professional development classes that give you the tips and confidence to succeed at participating in art shows. What is your sales strategy? Do you have one? When someone comes into the booth I start casually to see what their purpose is: simply liking my work, looking for an art piece for a particular spot, another weaver? It’s usually not too hard to figure this out. I have often had weavers come into my booth that eventually take my classes. If they have space for art I ask them: “Do you have a particular spot in your home that you are looking to fill with a piece of art?” These are the ones I make sure I spend some time with. I have them sign my guest book with their contact info, give them lots of cards and send them a thanks-for-coming note afterwards. How did you get your work in galleries? Recently, a lot of galleries have closed their doors. I have three galleries now, and one I’ve been with for over 20 years. The other two were from recommendations by friends to the owners. Cold calls almost never work. Do you make your living from tapestry? Yes, I make a living at my art, but not just at craft and art shows and fairs. 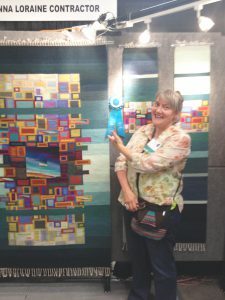 I teach, I enter and win Public Art Competitions (I have won 35-40 so far in my career and my tapestries are in public buildings throughout the state of New Mexico.) I also have galleries that represent me and I sell thru my website and social media. I use Facebook only. I need a place for image AND story. I do most of my student connections thru Facebook and about 1/3 of my sales. My website has given me mostly commissions and a few students. Often it helps a client identify what they think they saw at a show and are interested in. So they all work together really. How do you use social media to sell? I do progress posts of tapestries. Because of my production background, as well as my belief in a more-bang-for-the-buck style of design, I am able to complete large tapestries rather quickly. I usually catch someone’s interest while a tapestry is being made, which leads to sales. Who would you recommend craft shows to? Craft shows are not for the faint of heart or anyone with reduced stamina due to illness. They are usually three day selling affairs that start early and end late, (the BAM Show I did was 9:00 – 9:00 Friday to Sunday). It’s a one day set up (they used to have 2 days). I had no help at my last show. I have a small car, so I did 2 trips, one with my booth walls, (pro panels) and the next all the work, flooring, table, chair, and it was 104 degrees. Luckily it was a local show very close to my home. If you would like to see more of Donna’s work you can find her website here.